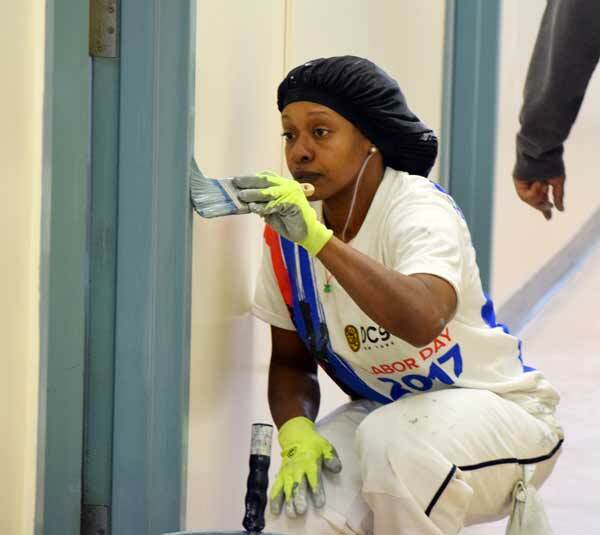 Members of the union gave a fresh coat of paint to the rooms and hallways of the Catholic Charities Mercy Gardens Home in Clinton Hill, which currently provides for 78 residents. Painting supply retailer Sherwin-Williams donated 80 gallons of paint to help maintain the Catholic Charities supportive housing building. Omar Robinson of Union District 9 was training apprentice painters and was happy to be giving back. “Being able to have an opportunity to give back does as much for the people who live here as it does for us,” said Robinson. “Being able to improve the building and homes for so many people truly goes a long way. Ian McDonald, the social services supervisor of Mercy Gardens, was thankful for the help. “It may not seem like a lot but being able to spruce the place up goes a long way,” explained McDonald. “We are so thankful to have so many people come out and give back to the community. Mercy Gardens is home to so many people, thanks to the work and commitment that so many people make to keep this place going. Since 1975, Catholic Charities Progress of Peoples (CCPOP) Development Corporation, the affordable housing developer of Catholic Charities Brooklyn and Queens, has transformed vacant land and buildings into affordable housing units. Mercy Gardens is part of the former motherhouse of the Brooklyn Sisters of Mercy. CCPOP has completed more than 3,600 units of housing, including 2,186 units of housing for low-income older adults, 1,068 units of family housing and 433 units of supportive housing for formerly homeless and individuals suffering mental illness or behavioral circumstances. Long live the memory of the inspiring words and deeds of the courageous Dr. Martin Luther King Jr.